This case study is part of a collection of pages developed by students in the 2012 introductory-level Geology and Human Health course in the Department of Earth Sciences, Montana State University. Learn more about this project. 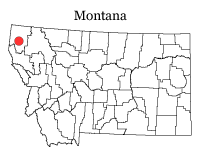 Libby is located in the northwest corner of Montana. Photo Courtesy of the Environmental Protection Agency. Libby, Montana, a small town nestled in the northwestern corner of the state, is a humble town, a great destination for anglers and hunters. What many people don't know about Libby, is the lurking danger hanging over the heads of the 3,000 or so Libby residents. Located nearby is an old vermiculite mine that has created a health hazard dealing with asbestos. The old mine was used for acquiring vermiculite, that was used for insulation, shingles, and other construction materials. Imbedded in the vermiculite is a form of asbestos that was released into the air when the vermiculite was processed, creating an abundance of the fibers released into the atmosphere around Libby. The health risk, amplified by human activity, has always been a health hazard due to natural geologic deposits of vermiculite containing asbestos, in and around the Libby area. This shows the mineral vermiculite in its natural form. Between the different layers are the harmful fibers of the Libby Amphibole asbestos. Photo courtesy of Environmental Protection Agency. Asbestos mines can be found throughout the country, including one town known as Libby, Montana. The small town of Libby is set in a valley carved by the Kootenai River in the northwestern corner of Montana. It is a very modest town with a population amounting to less than 3,000 people. Just like much of Montana, Libby is a great place to get outdoors and do some hiking, fishing, hunting, camping and skiing. However nestled in this backcountry is the lurking health hazard of a nearby vermiculite mine. 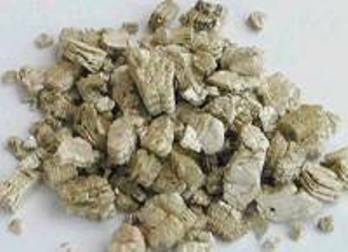 Vermiculite is not a form of asbestos itself but instead contains a rather uncommon form of asbestos ore known as Libby Amphibole asbestos. Libby Amphibole asbestos is very small in single fibers, so small that you need a microscope to view individual fibers. The ore is identified as "waxy-silky white to greenish white, with fibrous strands running across the surface. "(Peronard) This asbestos could not be used commercially due to the fact that it is so friable, it is rather seen as a contaminate to the vermiculite ore. "Historic mining, milling, and processing operations at the site are known to have caused releases of vermiculite and Libby Amphibole asbestos into the environment that have caused a range of adverse health effects in exposed people, including not only workers at the mine and processing facilities, but also in residents of Libby" (Peronard) The Environmental Protection Agency began efforts to clean Libby in November of 1999. A good place to start is the EPA Website on Libby asbestos. Libby Amphibole asbestos is a naturally occurring mineral that is native to the town of Libby, MT. Libby Amphibole or LA is an ore within the mineral vermiculite. It is often times found within the soil, sand and bodies of water in Libby. The most hazardous force of LA would be within the vermiculite insulation that is in many houses in and outside of Libby. The asbestos in Libby is only one form of Amphibole Asbestos, in fact Amphibole Asbestos can be found throughout various parts of the world. This map displays 28 sites around the United States that received asbestos-containing vermiculite from a mine in Libby, Montana. Photo courtesy of the Agency for Toxic Substances and Disease Registry. The Libby Amphibole Asbestos is virtually non-hazardous unless it is stirred up by physical activity. The individual fibers of Libby Amphiboles are so small that they can easily be transported by air. When the Vermiculite was processed at the mine the asbestos ore was released into the air and spread over the entire Libby community being absorbed by soils and settling in the homes of Libby residents. Additionally, the LA fibers were unintentionally transported from the mine on clothing, shoes, and in the cars of the mineworkers. As well as being transported, there are natural geologic deposits of LA within the city limits which can be disturbed by human activity. LA is not unique in it sense of transportation, many other asbestos minerals are transported very similarly; "Natural asbestos-bearing materials in eastern Australia have been disturbed by mining, road construction, agri- culture and forestry, urban development and through natural weathering processes." (Hendrickx; Naturally occurring asbestos in eastern Australia. 1) This disturbance has also allowed for fibers of amphibole asbestos to become a growing environmental and health concern within Australia. Libby Amphiboles have a single way of being transmitted into the biosphere. In fact this way is directly related to the transportation of the mineral. As said before LA is very small and is easily transported through the air. When it rains the particles of LA suspended within the air get caught by rain and brought back down to the surface. It is then deposited into soils, sand, or accumulates in dust within homes, garages or other buildings when settled. High winds and storms can move the asbestos around, with ease and cause it to be suspended in the air. This means it can then be inhaled by humans or animals. Even when not disturbed directly by human contact, LA can contaminate the soil in Libby, this is due to the natural geologic deposits of the Asbestos within the town. 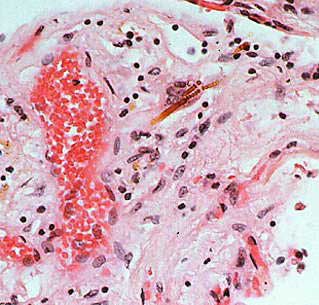 This photo shows a microscopic view of asbestos fibers becoming lodged in lung tissue. Photo courtesy of The Agency for Toxic Substances and Disease Registry. Asbestos is a carcinogenic pathogen; In fact "Asbestos is listed as a Category 1 carcinogen by world health authorities." (Hendrickx; Naturally occurring asbestos in eastern Australia. 1) LA is a carcinogen that is known to cause cancer of or around the lungs. Among lung cancer, it is known to cause several other respiratory illnesses. When the tiny fibers of asbestos are inhaled and not expelled from the body through coughing, or caught in mucus, the fibers will imbed themselves in the tissue of the lungs. This is the primary reason for diseases caused by asbestos. Among the diseases are lung cancer, mesothelioma, and asbestosis. For more information on health hazards caused by asbestos visit The Agency for Toxic Substances and Disease Registry. Lung cancer is when tumors form within the lining of the lungs and is usually fatal. Mesothelioma could be considered the worst of the diseases that can be caused by asbestos. Mesothelioma is a deadly form of cancer that is located on the lining of the lung and the chest cavity, it is nearly almost always fatal. The most effective way to prevent harmful effects of Asbestos is simply to avoid exposure to the mineral itself, as with any pathogen. However, this is nearly impossible due to the fact that asbestos is still a widely used mineral today. Many buildings still contain asbestos today and many workers are exposed daily. "The most efficient way to eliminate asbestos related diseases is to stop using all types of asbestos"(Elimination of Asbestos Related Diseases) For more information on health risks associated with asbestos visit the World Health Organization Webpage. The Environmental Protection Agency has worked diligently to try and reduce the amount of exposure citizens and workers have to the Asbestos. "As of October 2010, EPA has safely removed well over 900,000 cubic yards of asbestos-contaminated waste from major source areas and structures." (Cleanup Activities) For more on these activities visit the EPA superfund site for Libby. Gunter, Mickey, E. "Amphiboles: Environmental and Health Concerns" Mineralogical Society of America. Reviews in Mineralogy & Geochemistry Vol. 67, pp. 453-516. 2007. PDF File. Hendrickx, Marc. Carbonate-hosted asbestos occurrences in South Australia: review of geology and implications for mesothelioma, Australian Journal of Earth Sciences, vol 56: 5, 639 — 654. 2009. PDF File. Summary: This article talks about asbestos and where the natural deposits of Asbestos occur, including rock type and locations. It mostly speaks of Asbestos within Australia. It also talks about the health risks associated with Asbestos, especially mesothelioma. Hendrickx, Marc. "Naturally occurring asbestos in eastern Australia: a review of geological occurrence, disturbance and mesothelioma risk." Original Article. 2008. PDF File. "Cleanup Activities." EPA. Environmental Protection Agency, n.d. Web. 23 Oct. 2012. "Elimination of Asbestos Related Diseases." Www.who.int. World Health Organization, 2006. Web. 22 Oct. 12. Summary: This source provides great information for the health risks associated with asbestos, possible treatments and how to prevent acquiring this health problems.